Express Delivery, 1–2 business days from dispatch. DHC is a Japan’s most popular skincare company using the natural benefits of virgin olive oil in its products for over 25 years. They create top quality cosmetics using a unique combination of natural ingredients which are free from artificial colours, fragrances and parabens. DHCUK offer free one to one skin consultations to get the best product for your needs. 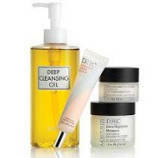 DHC Care is a site for Japanese cosmetics, and you instantly get that feel as soon as you visit. The layout of the site is simple and full of beautiful images to get the sense of beauty and skincare from the first look. The large slider at the top offers the latest sales and newest products at the site, helping to draw customers in from first glance. From there, you can find your way around by the images. There’s even a section for newcomers to understand more about DHC and the products on offer. Just with a glance at the homepage, you can order some free samples to give the company a try and find out about the free shipping options. There’s also a live chat clearly labelled to get in touch with a human, and a large search bar for those who have been here before and know exactly what they want. The only way that it could be better is to have a phone number somewhere. Instead, you have to scroll to the bottom for the Contact Us section to be able to send an email. It’s only then that the phone number is available in smaller print.